Over the past five years, Bermuda has been enjoying a resurgence of the local reggae and dancehall culture as artists, sound system crews, event promoters, and SB4L.com have been campaigning for the preservation and promotion of true reggae and dancehall culture events within Bermuda as bars and clubs have become the popular places for local night life. This single idea or mission statement motivated many sound system crews and DJs to feature more reggae and dancehall music in their sets, and promoters to host reggae and dancehall music-only events to ensure the genre was showcased in all of it artistic forms. To facilitate this new initiative of the culture, Sound Boyz 4 Life and SB4L.com was created to represent, archive, produce, promote, and feature all reggae and dancehall culture activities, local or abroad featuring Bermuda artists, sound crews, DJs, and promoters. As the movement has grown, SB4L.com has become the central hub for Bermuda night life promotion, local sound system information, and media content [photo, audio, and video recordings] of Bermuda’s reggae and dancehall culture from the past to the present. With Bermuda sound crews, DJs, artists, and promoters working together for one common interest, the culture has grown strength to strength as the return of Sound Clash and sound system events such “Anything Ah Anyting”, “King’s of the Hype Part 1 & Part 2″, “Bermy Cup Clash 1 & 2″, and “Killer Season Cup Clash 2016″ have been some of the most successful events in recent years that have increased patron demand for Sound Clash events. For the first time ever in Bermuda this summer, Sound Boyz 4 Life and SB4L.com will be hosting a “Sound System Festival” featuring more than 10 of Bermuda’s top sound system crews, providing information, entertainment, refreshments, and various exhibitions of the sound system, it’s creation, operation, and its future. More information will be announced soon. 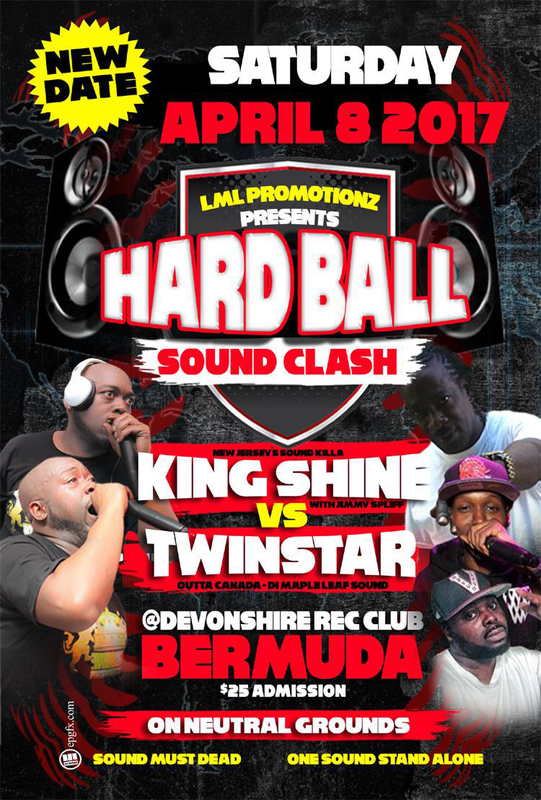 The upcoming SB4L endorsed event, hosted by Live My Life Promotion, is the international edition of “Hard-Ball Sound Clash” featuring King Shine Sound versus Twin Star International “On Neutral Ground” at the Devonshire Recreation Club, on Saturday, April 8. Representing Canada is “The World Sound Twin Star International” with talented selectors Peasah, Wizzla, and Blaxz, who are the two time [2015 and 2016] Africa Cup Clash Champions. Twin Star is currently participating in the popular Boom All Star Sound Clash series in Kingston, Jamaica, where they recently faced off against Bass Odyssey Sound and Code Red Sound. This Twin Star International is not to be confused with the local twins Nicai and Nico who DJ for Twin Star Sound. Representing the United States of America is the highly rated and respected King Shine Sound, who is the 2017 Brooklyn Show Down Champion, who is about to embark on several weeks of sound clash across the globe as they will be performing April 8 in Bermuda, then taking part in “War Inna East Sound Clash” held in Germany on April 14, then finishing up at the Irish and Chin “Road to World Clash – US Rumble 2017 edition” in New York on April 22. The last international competitors-only Sound Clash to take place in Bermuda was in June 2000, featuring Tony Matterhorn representing America, versus Fire Links of Jamaica at North Village Field, where Matterhorn was in the prime of his solo career and Fire Links was just starting his solo career. At the time, Bermuda hosted sounds weekly from Jamaica, America, Canada, the United Kingdom, and even Japan as Mighty Crown the Far East Rulers had performed in Bermuda a handful of times by the end of the 90s era. It has been some time since Bermuda has been considered a premier place for reggae and dancehall events featuring top top-tier international acts, and SB4L.com believe Bermuda has been missing this ‘wow’ factor as Sound Clash culture is now a global industry with sound clashes happening weekly around the world. With the advent of live streaming events and media outlets providing promotional service and in-depth event coverage, patrons can watch, listen or read from the comfort of their home. The island is in dire need of this entertainment, as local sound clash is slowly becoming popular again, but has been in need of international influence and exposure. This upcoming event, on April 8, is guaranteed to be a night of musical madness as both sounds are set to battle for the Hardball Clash trophy and local patron approval until the very last song. All lovers of reggae and dancehall music are encouraged to come out and be entertained by world class sounds. Admission is $25, with gates opening at 10.00pm and the clash starting at 11.00pm sharp. SB4L.com will see you there! None of them sound like Jammys!